Isn’t this location beautiful? 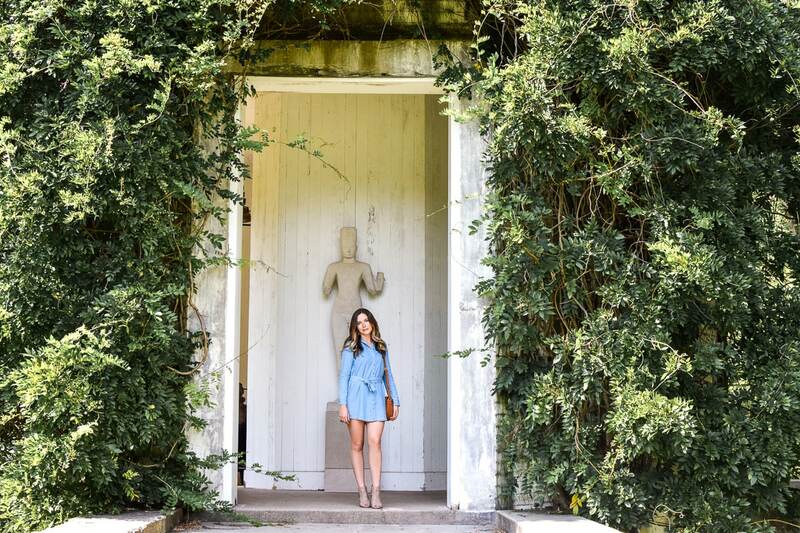 We headed to Allerton Mansion to spend the afternoon walking their sprawling gardens. We can’t talk about fall trends without talking about denim. I look forward to seeing the new ways denim gets incorporated into each fall season! This year, it’s all about the denim dresses and tops. Incorporating denim in this way gives an instant Americana vibe. 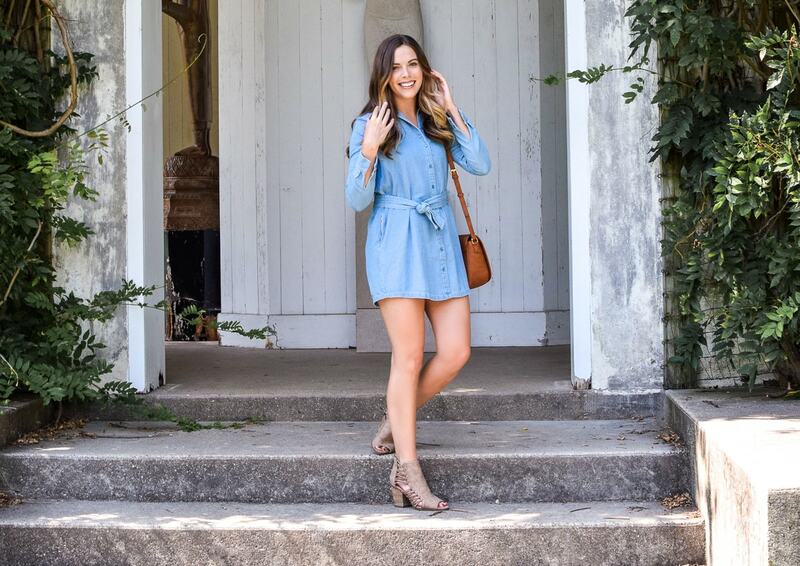 This denim dress I’m wearing looks perfect with booties now while the weather is still warm. Wear it with tights and riding boots later this fall! So versatile! 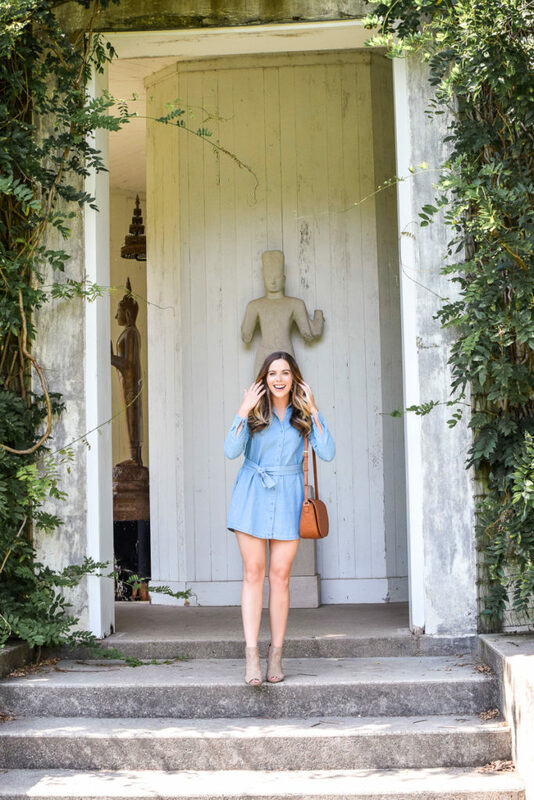 You can get my denim shirt dress for yourself here! To totally rock the Americana look that you’ll be seeing everywhere, add a touch of well-placed leather to your line up. Whether it’s a bag, belt, earrings, or some other accessory, I’m seeing leather everywhere. Just a touch is all that is needed, even if it’s just in the details! 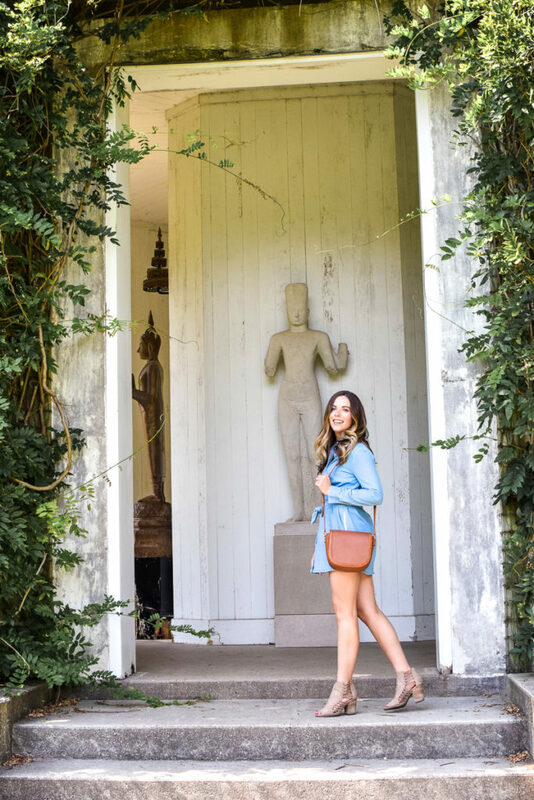 I have my Sole Society cross body that’s light weight and easy to carry everywhere. The cognac color is beautiful and easy to match! I’m a firm believer that you can never have too many boots. I wear my riding boots, short booties, and peep-toe boots all the time. This year, get yourself a pair of boots with lace up or perforated detailing. I’ve posted about the lace-up booties that I’m wearing with the denim dress before, you can find them online still here! If you’re going for a super sophisticated look, find a pair of black boots with metal detailing. Last year, studs and tough accents were hot and they’ll be back this year. I’m wearing this pair of black booties with a silver ring detail- right on trend! Get them here for under $40! Make every top and blouse feel special with wide, bell sleeves this year. They add a feminine touch to any outfit! Bell sleeves make arms appear super slim and add movement to an outfit. I’ve noticed flared sleeves on every kind of top from button ups to sweaters recently. There are so many ways to wear it! I’ve paired mine with distressed denim and a belt. I’ve also been swooning over dramatic bell-sleeve tops worn with mini skirts! 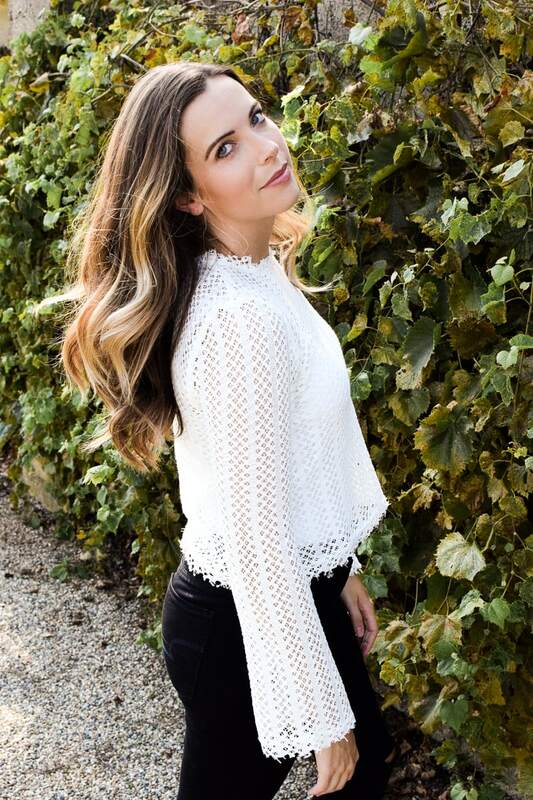 Isn’t this cross-stitch top from the Style Theory Collective stunning? This top has a flared bell sleeve and cropped fit. I love the frayed hem! Imperfect details like this keep it casual and not too zipped up. I was so excited to partner with Lisa because she not only runs an amazing clothing boutique, but she also supports Boss Girls living their dream. She’s also the host of “The Future is Female” pop-up in NYC that features businesses run by, you guessed it, women! It is so important to give women in business a voice and that is one of Lisa’s passions. She’s fearless! Be sure to follow Lisa by checking out the links below! What are your favorite fall trends? Share below! Loved this post! Your outfits are awesome 🙂 Thanks for the tips! I’m loving all the leather! Fantastic looks! Love the last photo of you, too cute!